Study on your schedule with our online library and writing tools. The Questia library includes more than 94,000 academic books and more than 14 million journal, magazine, and newspaper articles from more than a thousand of the world's leading publishers. Questia offers quality sources selected by librarians and approved by professors, and many of the resources are peer-reviewed! Paid subscribers can use our browser extensions to save research from any book or article into their Questia project folders. Write with Questia in Microsoft Word and Google Docs. 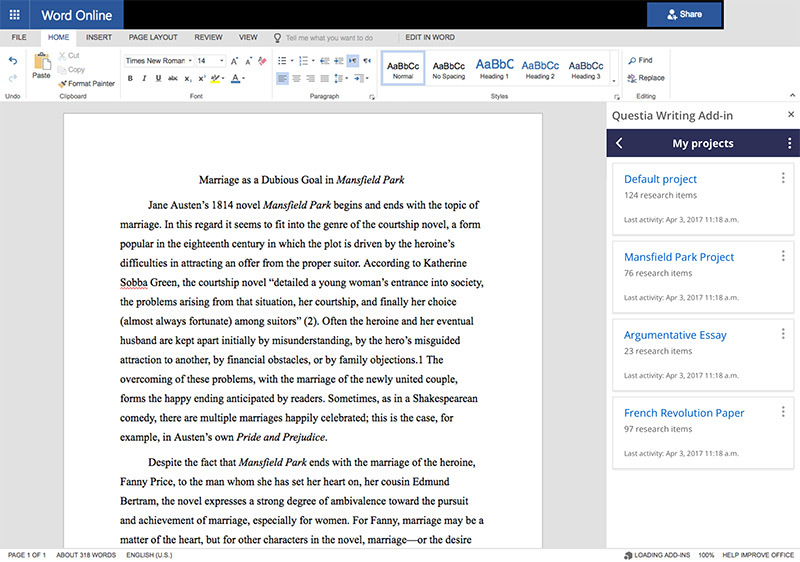 Now you can open up Questia as an Add-in to Microsoft Word and Google Docs, giving you side-by-side access to Questia’s library, your project folders, and Questia’s writing tools, plus help with common writing questions – as you are writing! Enjoy Questia wherever you go. Using Questia's Responsive website, or one of our apps, you can do your research the way you want to, wherever you want to. To download the Questia app for your device, choose from the options below.